A romantic drive up the Ghat Road from Kallar to Ootacamund or Ooty and then from Palani till you reach exotic Kodaikanal brings out the poet in you. Drive past submerged paddy fields, thick palm groves and wild brush adorned with tiny purple, red, yellow and crimson blossoms till you begin your drive through narrow mountain roads past silver oaks and scented spice plantations. 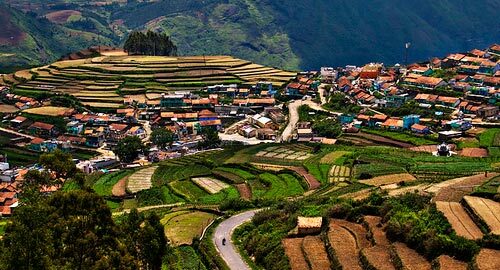 Fruit orchards greet you the moment you enter exotic green Kodaikanal in Tamil Nadu, India. Honeymoon tours in Kodaikanal is perhaps one of the most apt ways of enjoying this natural paradise perched atop the Western Ghats in Tamil Nadu, South India. Honeymoon in Kodaikanal, hold hands and trek through wood trails as you whisper sweet nothings to each other while birds play natural music in the background. Discover British legacies that dominate this un touched honeymoon paradise high up on the Western Ghats. Kodaikanal is the best Honeymoon Destination in India. Set out on romantic boat cruises on the enchanting star-shaped Kodai Lake on your honeymoon in Kodaikanal in Tamil Nadu, India. The perfect time to tour the attractions of delightful Kodaikanal is during the months of August-September. Situated at a height of 2,133 meters above the sea level, Kodaikanal offers you secluded and quaint nature spots that give an opportunity to bond with each other and delight in the seductive Kodaikanal charms. The nearest airport is located at Madurai at a distance of 120 kilometers from Kodaikanal and the nearest railhead is situated at a distance of 80 kilometers from Kodaikanal, Tamil Nadu, South India. Visit the Bryant Park, Pillar Rocks, Coakers Park and the breathtaking Green Valley as you set out on a exploratory tour with your beloved while you honeymoon in Kodaikanal, Tamil Nadu, South India.